Cleveland has a huge amount of Slovenian culture and Slovenian descendants, so it it perhaps not surprising that Cleveland is home to a local celebration of Slovenian Mardi Gras – Kurentovanje. The emblem of Kurentovanje are the Kurents, big fuzzy beasts who romp through town during Mardi Gras (called Pust in Slovenia), ringing bells loudly. The Kurents are rumored to have the power to chase away winter with their ruckus. For Slovenian Mardi Gras, a traditional food is Krofi – or doughnuts. Doughnuts are a popular choice for Mardi Gras celebrations around the world, since they would use up some of the ingredients that would then be forbidden in Lent: sugar, butter, and oil! Slovenian krofi are simple to make, and mirror the other Mardi Gras fried sweet fritters found worldwide like Paczki, Malasadas, Semla and Chiacchiere. Here are recipes from homemade krofi from E-Slovenie and Homemade Slovenian food. Though krofi looks delicious, we are more intrigued by the Kurents! Today is Fat Tuesday – aka Mardi Gras – which means it is Paczki Day! In Cleveland (and Chicago…and elsewhere) this is a pretty big deal – and the Polish jelly-filled doughnuts called Pączki pop up nearly everywhere. If you have a sweet tooth, you don’t want to be left out of this tradition. Cleveland.com has a guide to the best places in town the get a paczki, and they will even be live-Tweeting and Instagramming from Rudy’s Bakery in Parma, epicenter of the Paczki madness. Traditional Polish fillings are prune, jelly and poppyseed, but every year brings more unique flavors. There is even an enigmatic cannoli paczki at Colozza’s (seen below), which may just be the most Cleveland thing ever! Or go one step further, with a paczki filled with ice cream at Mitchell’s. New Orleans is one of our favorite food cities (heck, ANY type of city) in the US. Unfortunately, it seems like NOLA only enters the general public consciousness around Mardi Gras Time (which is right around the corner). We like to go to New Orleans on Super Sunday, the big Mardi Gras Indian parade day, and while there is a ton of street food available at the parade, the standout was sweet potato and pecan pies from Tee-Eva’s. When we were at Super Sunday in 2016, we happened upon the ebullient Miss Eva Perry herself, selling her homemade pralines and pies to the crowds, and chatting with everyone like they were old friends. And we have to say, this was the best pecan pie we have ever had! Fortunately we found out that Tee-Eva also has a long-standing bricks and mortar shop (5201 Magazine St, New Orleans, LA 70115), so you can sample some delicious treats (and full-sized pies) any time you are in NOLA. Definitely take some time to explore outside of the French Quarter and visit Tee-Eva’s! It seems that there are two main categories of Mardi Gras food, rich, sweet cakes meant to use up all the sugar and fat before Lent, and savory,”lucky” foods. 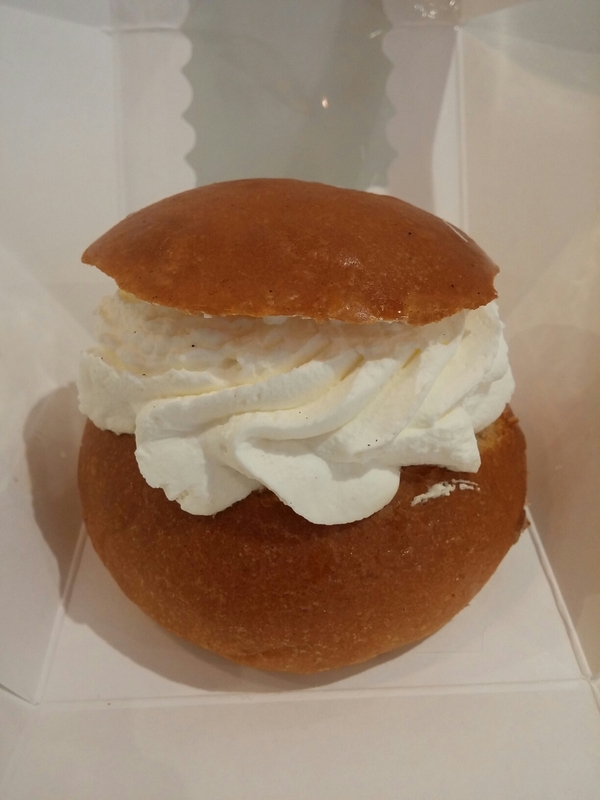 In the sweet camp are Polish Paczki, French galette des rois, Scandinavian Semla (called vastlakukkel in Estonia) or Hawaiian Malasadas. On the other hand are savory foods that are deemed lucky. In Eastern Europe, one such lucky, savory dish is a hearty pea soup. The classic Estonian Mardi Gras Soup is called hernesupp, and is a hearty mix of yellow split peas and pork. Check out these classic recipes from Nami-Nami (seen below) and Stanford. As we enter mid-February, Carnevale / Mardi Gras / Carnival is right around the corner! It’s never too early to start planning some sweet treats for the festivities. In Italy, Carnevale is a big deal, and Mardi Gras (or Shrove Tuesday) is celebrated with sweet, fried dough fritters called Chiacchiere. The simple-to-make Chiacchiere is popular throughout Italy, and goes by many regional names including Frappe, Cenci, Guanti and Bugie. There is a tradition of serving fried dough or doughnuts on Mardi Gras (think beignets, paczki and malasadas), in order to use up all the sugar and fats in the house before the austerity of Lent sets in, and Chiacchiere is no exception. Here are a few traditional Chiacchiere recipes from Academia Barilla, Cooking with Rosetta and Napoli Unplugged. We can hardly believe it – but Mardi Gras is next Tuesday – February 9th! Nowhere does Mardi Gras like New Orleans, and an integral part of the celebration in the city is the iconic purple, yellow and green King Cake. However, if you are in New Orleans around this time of year you are completely spoiled for choice. So that’s where the King Cake Database comes into play – you can search by name, neighborhood or by type of king cake desired (traditional, dietary specifications, etc.). Laissez les bons temps rouler! [updated 2/2016] Happy Mardi Gras! In Chicago, the classic Mardi Gras treat of choice is the Paczki, however we are also big fans of a fried doughy treat right out of New Orleans, the beignet! While we are not going to be near Cafe Du Monde, we are hoping to get some of that NOLA spirit, so where to go in Chicago? It turns out there are quite a few places. You can get beignets in Chicago at Jimmy’s which specialized in NOLA-style beignets, Big Jones and our new favorite beignet: Butcher & Burger, which also serves Cafe Du Monde coffee. Of course, you can always make your own. Laissez les bon temps rouler! Beignet from Cafe du Monde in New Orleans. Tomorrow is the Thursday before Mardi Gras – fat Thursday – which means it is paczki day in Chicago – an unofficial holiday which is an opportunity to gorge oneself on Polish filled doughnuts called paczkis. We have done a little bit of paczki coverage over the years, and there are ton of places in the Chicagoland area that serve up great paczkis around this time of year, both traditional and inventively-flavored. Time Out Chicago has a shortlist of paczki bakeries, and DNA info has paczki locations mapped out. Evanston bakery Bennison’s even has a paczki-eating competition on Feb 14 for diehards. It’s Mardi Gras / Fat Tuesday / Carnaval! Hope you are having a festive time, or at least enjoying some festive treats. We’ve written about many Fat Tuesday goodies in the past including the inimitable Chicago doughnut staple, the Paczki. Like the Polish Paczki, the Portuguese malasada is a filled doughnut without a hole, eaten as a last indulgence before Lent. 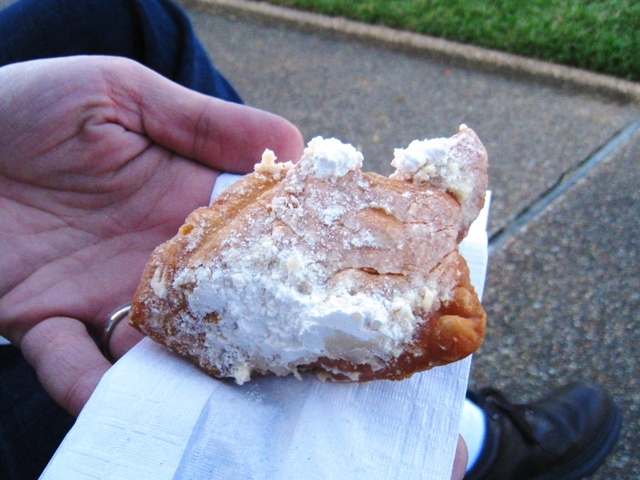 The malasada first came to Hawaii with Portuguese immigrants in the late 19th century, and has since become immensely popular in Hawaii as well as in Madeira and the Azores. Due to the treat’s popularity, Shrove Tuesday in Hawaii is informally known as “Malasada day” and at the iconic Leonard’s Bakery in Honolulu (933 Kapahulu Ave, Honolulu, HI 96816) you can even get plush Malasada toys alongside the coveted pastries. Traditionally, Malasadas were not filled, but today in Hawaii you can get fun fillings like Coconut (Haupia), Chocolate and Passion Fruit. Saveur even has a recipe for Leonard’s signature Malasadas. Like many other counties, Denmark celebrates Shrove Tuesday/Mardi Gras – Fastelavn – with merriment, rich treats and other festivities. But you’ll never guess where it pops up outside of Denmark – Brooklyn. Apparently there is still a yearly Fastelavn celebration going strong in Sunset Park, at the 120-year-old Danish Athletic Club. We love hearing about hidden cultural pockets like this, still surviving after 100+ years. When we were in Chicago for Fat Tuesday, it was not uncommon to have a friend or co-worker bring over a box of fresh Paczki. Paczki, a type of jelly- filled doughnut, originated in Poland (the official plural in Polish is pączki -pączek is the singular form), as a way to use up sugar and butter before the start of Lent. 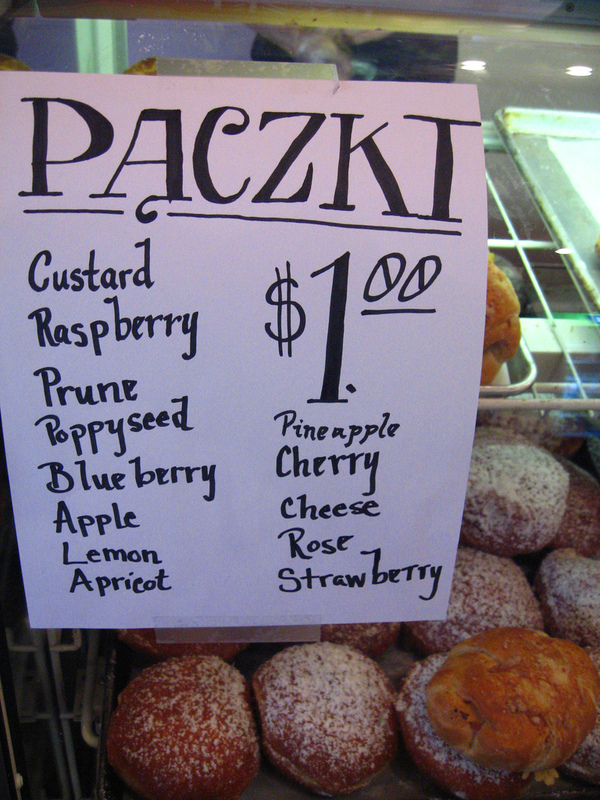 Unsurprisingly, Paczki Day is really big in Chicago, which has one of the biggest Polish populations outside of Poland. In Michigan, Hamtramck and Detroit are also epicenters of paczki culture. So what is a pączek like? The texture of a pączek is a bit denser than a jelly doughnut, and the jam fillings range from standard raspberry to more creative varieties, such as rose-hip or even guava (you may also see cream fillings). Louisa Chu on the WBEZ blog lists some top picks for Paczki in Chicago, and DNA Info rounds out the list even further. Rest assured, if you are in Chicago, you can get your Paczki fix.